Monday, March 6, 1865.Washington, DC. Lincoln converses with former Congressman John T. Stuart (Ill.) and gives him card to Hanson A. Risley. Abraham Lincoln to Hanson A. Risley, 6 March 1865, CW, 8:337. Senate committee announces to President that Senate is ready to receive communications. Senate Journal, 348; Daily National Republican (Washington, DC), 6 March 1865, 2d ed., Extra, 2:6. At noon President receives diplomatic corps. Evening Star (Washington, DC), 6 March 1865, 2d ed., 2:4. Poses for photograph by Henry F. Warren of Waltham, Mass. Frederick H. Meserve and Carl Sandburg, The Photographs of Abraham Lincoln (New York: Harcourt Brace, 1944), 6 March 1865. In conference with Marcus L. Ward, philanthropist, "soldiers' friend," and later governor of New Jersey, reiterates value of Vice President Johnson in work before administration. Washington Chronicle, 23 April 1865. Secretary of the Treasury William P. Fessenden resigns. Josiah G. Holland, The Life of Abraham Lincoln (Springfield, MA: G. Bill, 1866), 505. Chief Justice Chase consults with President an hour in effort to exempt counties in eastern Virginia from "insurrectionary proclamation." Welles, Diary. Nominates Comptroller of Currency Hugh McCulloch as secretary of treasury. Daily National Republican (Washington, DC), 6 March 1865, 2d ed., Extra, 2:4; Arnold, 628. Notifies Senator Charles Sumner (Mass. ): "Unless you send me word to the contrary, I shall this evening call with my carriage at your house, to take you with me to the Inauguration Ball." Abraham Lincoln to Charles Sumner, 6 March 1865, CW, 8:337. Sometime after 10 P.M., President Lincoln and his wife, Mary, arrive at the Patent Office, where they attend the inaugural ball. 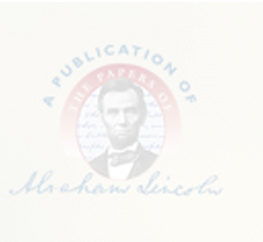 A newspaper reports, "Mrs. Lincoln . . . wore a white silk skirt and boddice, an elaborately-worked white lace dress over the silk skirt . . . The President was dressed in black, with white kid gloves. . . . Shortly after midnight the Presidential party were escorted to the supper room." After dinner, "President Lincoln and party withdrew about one o'clock . . . It is estimated that not less than four thousand persons were present at this ball." Evening Star (Washington, DC), 7 March 1865, 2d ed., Extra, 2:4-5. Lincoln receives February salary warrant for $1,976.22. Pratt, Personal Finances, 184. Writes Sec. Seward: "I have some wish that Thomas D. Jones, of Cincinnati, and John J. Piatt [poet], now of this city, should have some of those moderate sized consulates which facilitate artists a little [in] their profession. Please watch for chances." Abraham Lincoln to William H. Seward, 6 March 1865, CW, 8:337.